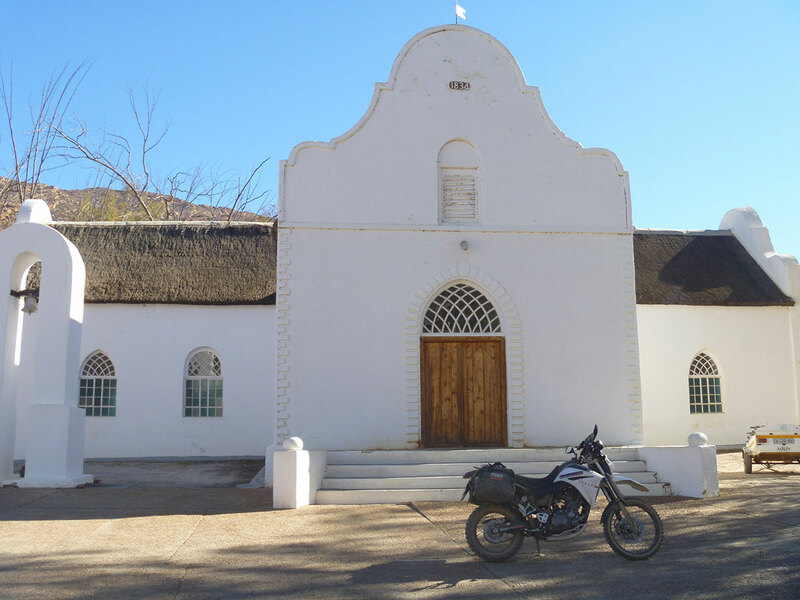 I recently got back from a trip around Cederberg and Karoo in South Africa, organised by Craig and Neil from Dualsport Africa and Yamaha Adventure respectively. 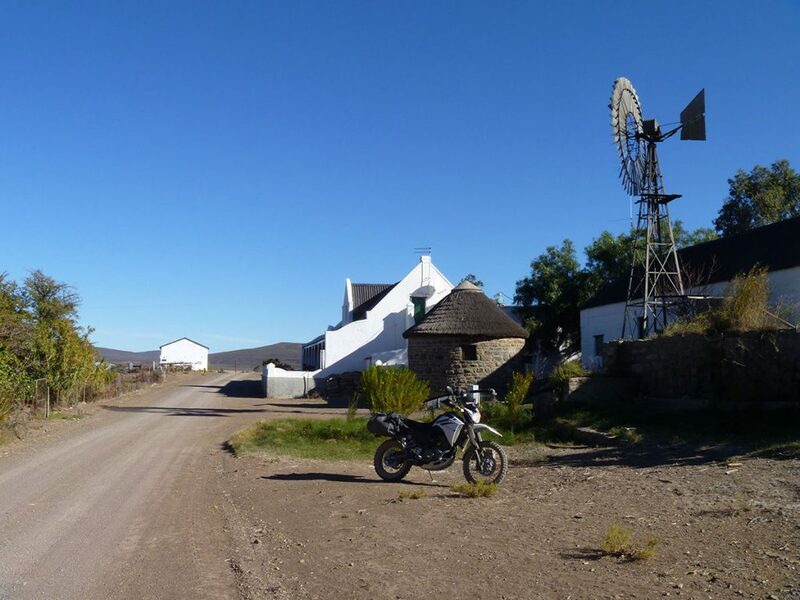 Craig’s website is THE go-to source for information and routes for travelling around Southern Africa and he works with operators like Neil to offer guided and self-guided motorcycle tours in Southern Africa. Cederberg is stunning and reminded me a lot of outback Australia. 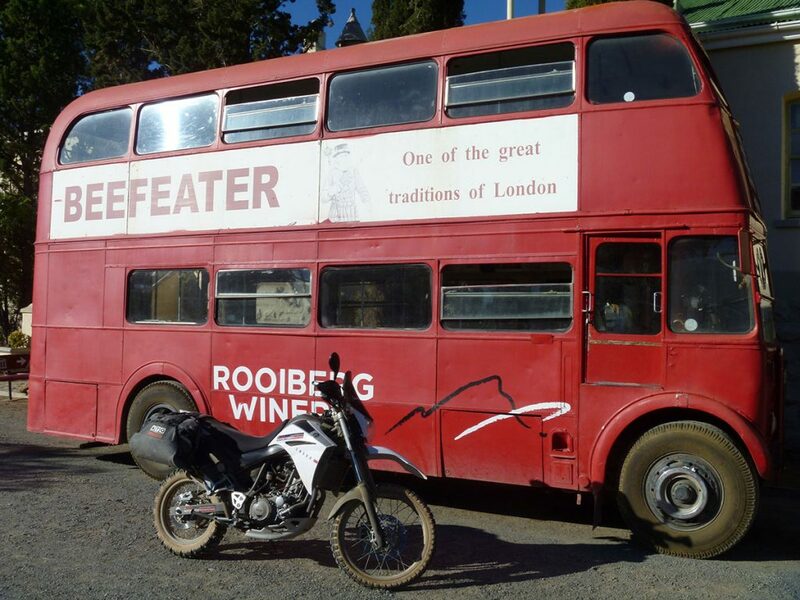 Karoo was interesting, but I would opt to spend more time in Cederberg. GPS routes and accommodation were all very well thought out and organised. Camping is definitely possible and would be a nice option as the towns aren’t the highlight. XT660 handled the roads in style. Bigger bikes would have been even more comfortable on the dirt highways, but I prefer smaller bikes, especially in the rougher stuff. Neil at Yamaha Adventures was a great help and set the bike up perfectly. 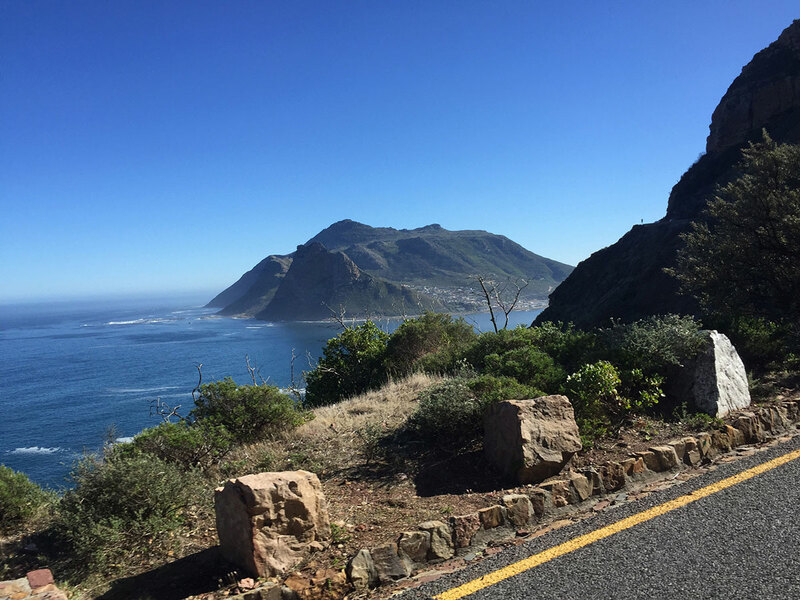 Chapman’s Peak Drive, the Cape Peninsula and Baden Powell Drive are is also worth a ride if you have an extra day. You could even do the R44 from Gordon’s Bay around to Betty’s Bay, Bot River and Back as well to have a great day of coastal riding. 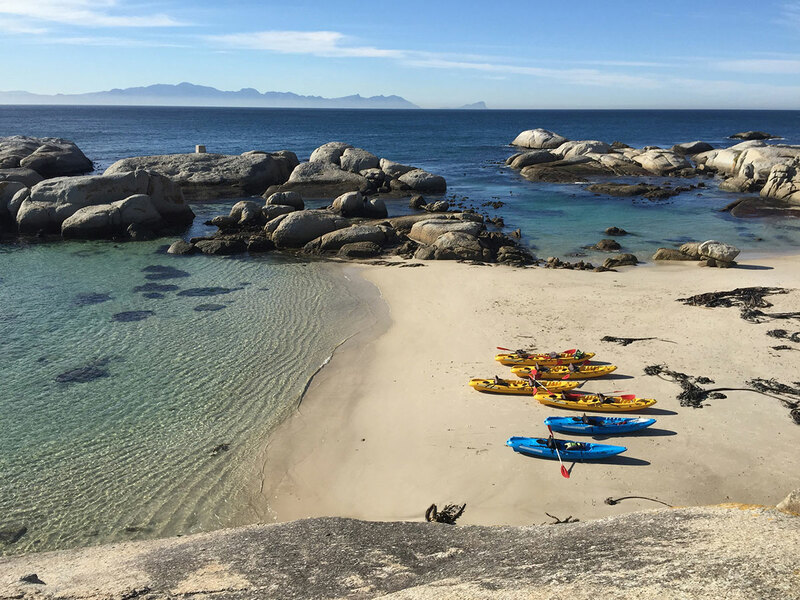 Finish off your trip with a kayak or snorkel with the seals and penguins at Seaforth Beach. Cage diving was called off for me and this was a great alternative. 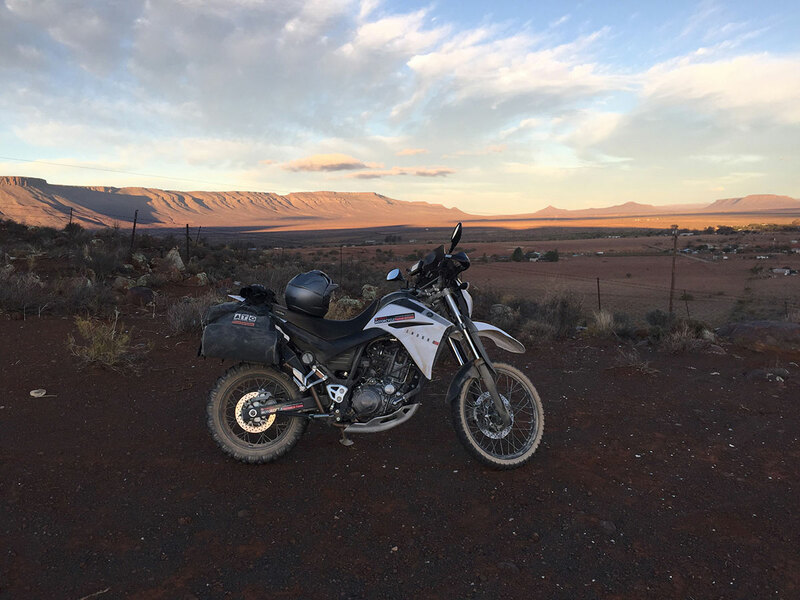 At the start of day one you head to the dealership providing your bike, in my case it was Yamaha Adventure, based out of Hedelberg Yamaha in Somerset West (around 50 km out of Cape Town). On arrival I was given a very friendly welcome by the owner, Neil, who took me through some very short admin, before a bit of a briefing on the bike, the panniers and the GPS. I must say too that I arrived on a South African public holiday (Workers’ Day) and Neil had not only come in specially for me, but was also willing to serve the couple of people who rocked up while I was there, even though the shop was officially closed. The bike I had chosen was a 2016 Yamaha XT660R, which I had never ridden before, but had always wanted to try. The shop also rents out XT1200Z Super Teneres, but they are about 50% more expensive and I prefer smaller bikes anyway. The bike was loaded with a Garmin Montana GPS (on which my route for each day had been preloaded as a track), ATG soft panniers, Mitas tyres (E09 Dakar on the rear and E10 on the front) and a Star Trac tracking system and Rider Down that would alert Neil if I had an off, so he could check in with me and call in the cavalry if required. Nothing was new, but is was obviously well cared for and in excellent shape. 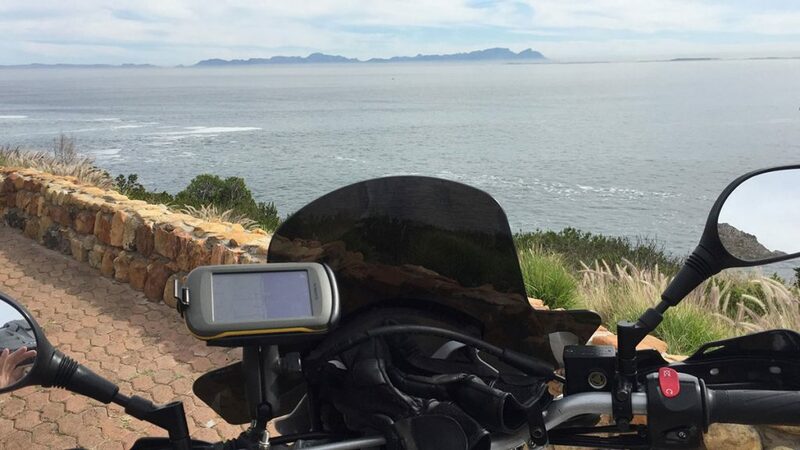 After loading up the bike in the dealership and dumping all of my excess gear in his office, it was off around the coastal road to start, along the R44 from Gordon’s Bay to Betty’s Bay, before heading inland for a rest stop at Bots River, where the dirt roads were to start. I had just come off a pretty boozy ‘work’ trip so the tarmac twists of the R44 were a great way to ease into things. 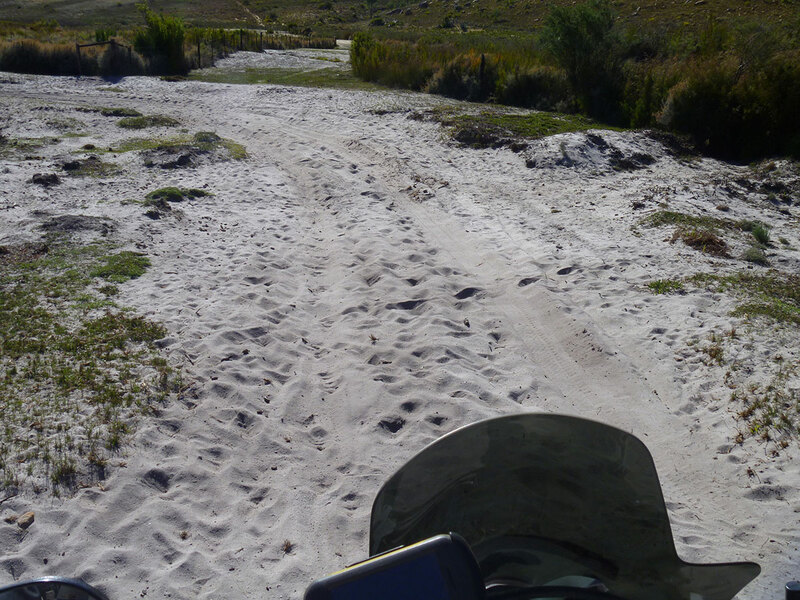 After a quick lunch at the very local Bots River Hotel I was eager to get onto the dirt. The roads Craig had chosen certainly didn’t disappoint and were fast flowing dirt highways, through the farming communities. 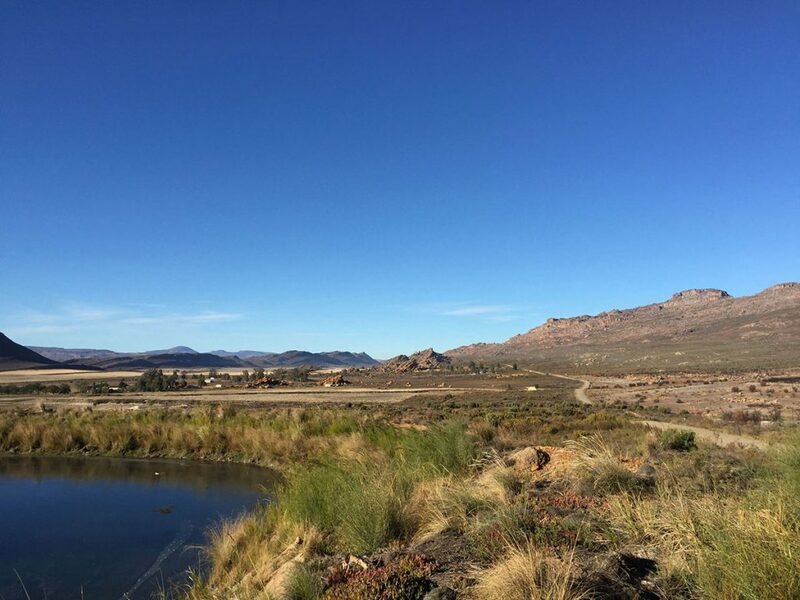 Starting on the Van Der Stel Pass Road, I headed north up past the Theewaterskloof Dam and then east towards Robertson, Ashton and the Ouberg Pass (Montagu), before heading north again to Touws River and east to my final stop in Matjiesfontein. In Matjiesfontein, a tiny well-preserved slice of colonial history, I was greeted on a arrival by a town cryer, dressed to the nines in colonial style, who invited me into the pub adjoining the Lord Milner Hotel, before calling out to the small handful of tourists that were staying in the town to board the double-decker London bus for a tour around the one-street town. I didn’t join them on the bus (I was there to escape London, not reminisce about it), but did have a pint in the pub after getting changed, then headed into the dining room (the hotel is the only place to eat in town) for some biltong ravioli and Karoo lamb. The hotel was a bit more than I needed by myself on this trip, but it was worth it for the novelty. The rooms were comfortable enough and the food was really nice. Highlights: Ouberg Pass (Sutherland), sunset from Akkerendam Nature Reserve in Calvina. 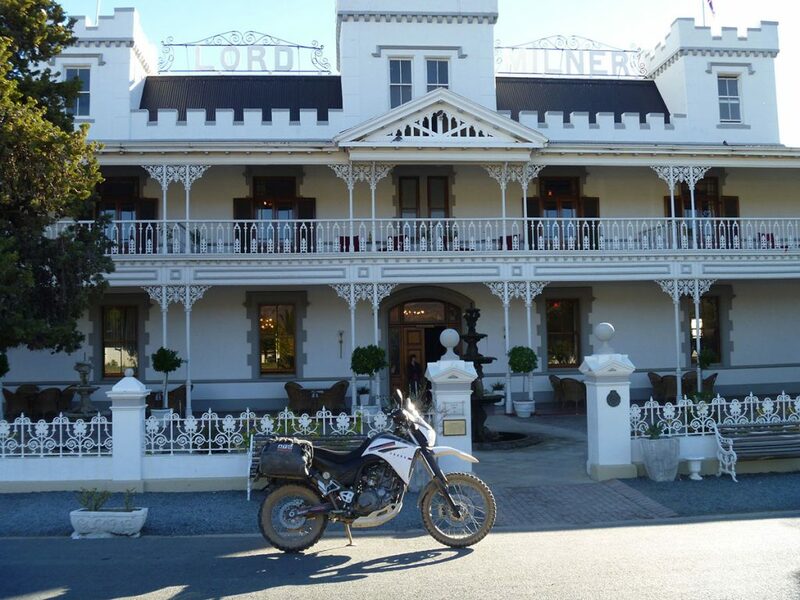 After too large a breakfast in the grand dining room of the Lord Milner, I headed off up the R354, before diverting off onto, back onto gravel roads, heading towards Sutherland to grab some fuel. 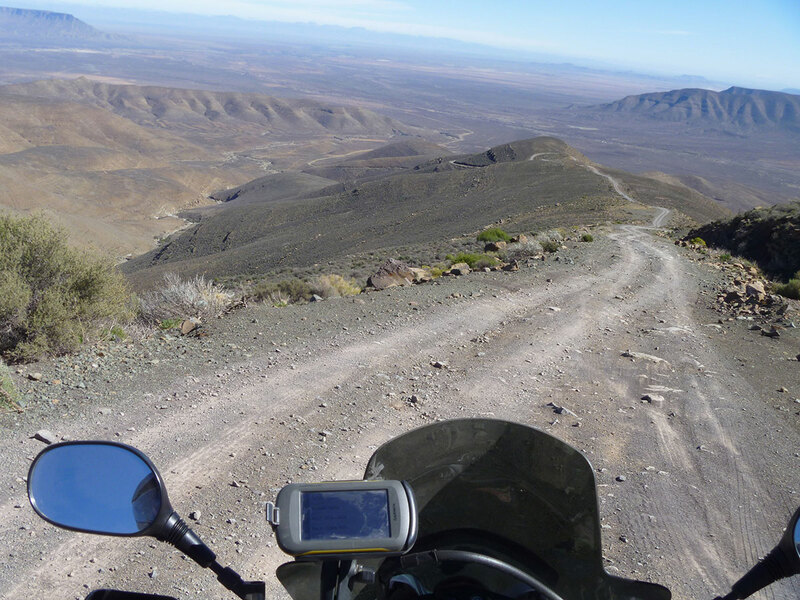 Doubling back briefly, I headed up the Bo-Visrivier Road, to another pass called Ouberg Pass (Sutherland), which was the best dirt riding so far and offered stunning views into the Tankwa Karoo National Park. My route was to take me back to the Bo-Visrivier Road, but I would have loved to have continued down into the valley over the pass and headed up into the National Park. My route wasn’t half bad at all, but I’d just had a taste of some rougher 4WD tracks and I was yearning for more. 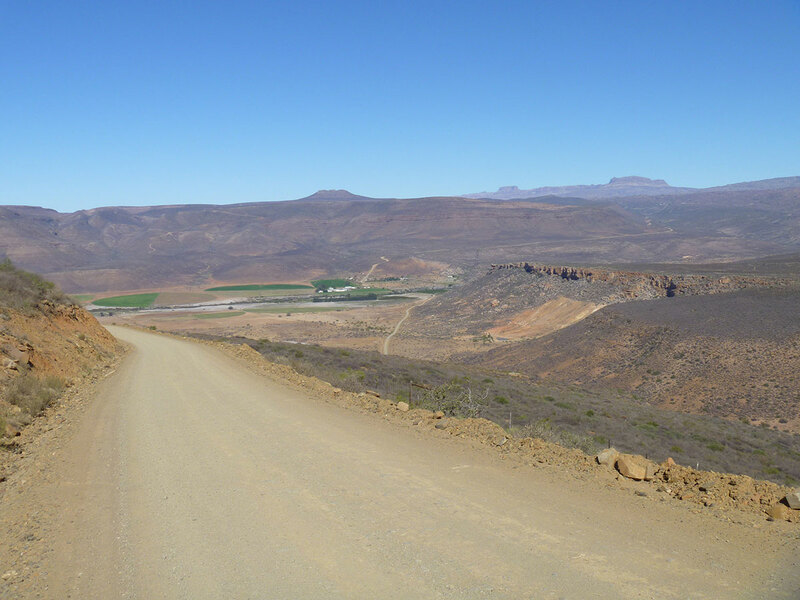 Coming off the Ouberg Pass it was back onto the Bo-Visrivier Road, and then north to rejoin the R354 (paved) for the final push to the rural township of Calvina. In Calvina I was staying at the Die Blou Nartjie Guesthouse, which was clean and comfortable, with a very relaxing garden and space to work on your bike if you needed to.There isn’t a whole lot to see in Calvina, but it is definitely worth heading up to the Akkerendam Nature Reserve, located just on the outskirts of the town to the north, to check out the view of the valley and watch the sunset. There is a gate to the reserve, but I didn’t see any sign of it closing, although I didn’t hang around too long after sunset, just in case. Dinner was at the Die Blou Nartjie Guesthouse restaurant and was very tasty. I had Karoo lamb pie, with some local red to wash it down. Can’t go wrong with either of those things. Earlier in the day I also had the chance to try some ‘wet’ biltong, from the butcher on Hoop St, just across form the my guesthouse. Well worth trying here (or anywhere else in South Africa), if you are into biltong. I love it and luckily for me it was very easy to find along the way. 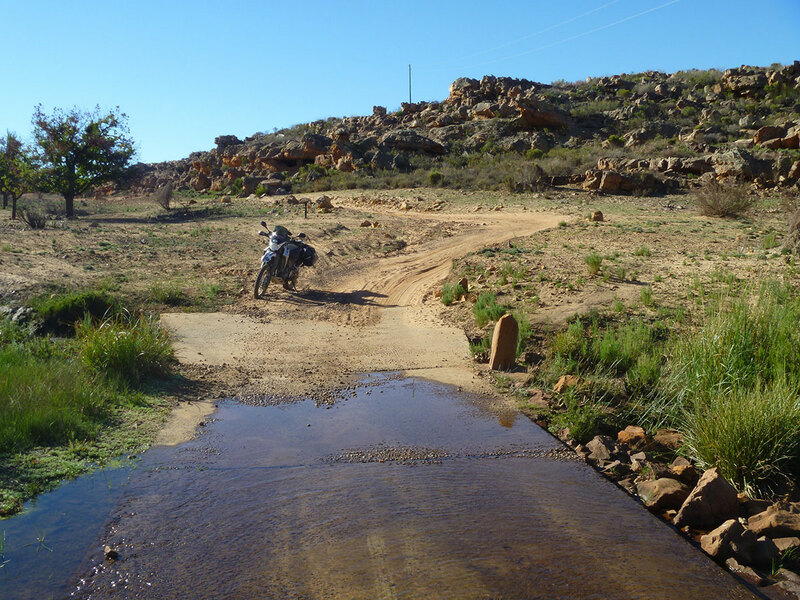 On leaving Calvina, the first section of the ride was on bitumen along the R27 for around 40 km, before turning off onto the R364. Along the way I passed the turnoff to the R335, know as ‘Karoo Poort’, to the south, which has the title of South Africa’s longest uninterrupted dirt road (257 km), running from Ceres in the south, to Calvina in the north. My route was taking me on the R364 towards Clanwilliam though and riding along that was very similar to the previous days, until just after the turn off to Wupperthal, where the road returned to tarmac and headed in to the rocklands of the Kliphuis Nature Reserve, and into Clanwilliam, which was great fun. Clanwilliam itself if a pleasant little farming centre, much greener and more inviting than the towns I had travelled through to get there. Instead of continuing on south from Clanwilliam and along the Rondegatrivier, before heading east again into Cerderberg Wilderness Area and on to the Cederberg Oasis as was loaded in my gps, I actually fuelled up in Clanwilliam and backtracked, back through the Kliphuis Nature Reserve (which was just as fun on the way back) and to the turnoff to Wupperthal. I had heard good things about this route, and was looking for something a bit more adventurous than the dirt highways I had been riding. 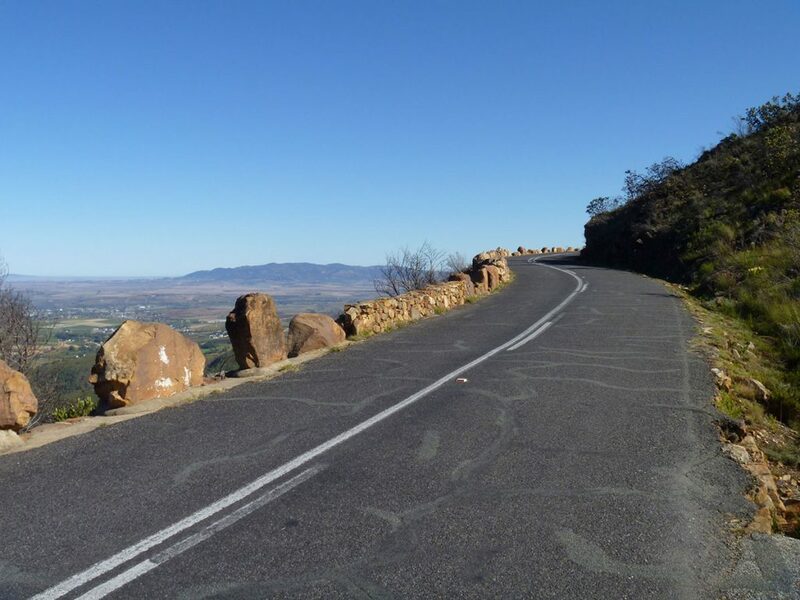 The road started off the same as the others, but the views were great as you ride up along a ridge line looking out over the veld. Things got a lot more interesting when I took a wrong turn off the Hoek SE Berg Pass, not long before Wupperthal, looking for a more challenging route and ended up on some deep sandy 4WD tracks (not advised unless you are very comfortable riding off road), heading through a tiny hamlet called Heunlingvlei. I knew I was heading off piste, pretty early in, but I wanted to see if the route I had chosen would eventually pan out. It didn’t and would have taken me back toward Clanwilliam, but it was heaps of fun and made me want to stay in the area and explore for a few days. I didn’t have the time though, so I backtracked back out again to the main Wupperthal road and headed into the sleepy green little hamlet of Wupperthal. From here the road got more interesting anyway, heading up the Maitjesriver 4WD track to the Eselbank Pass/Die Poort (‘the gate’) and down to Langkloof. To start off the track was paved with cement in a rudimentary way, which I guess made it easier for some vehicles to go up through the rocky terrain, but on a dual sport bike I would have preferred not to have the sharp edges and unnatural angles that it presented. It was easy enough through and finally ran out into some pretty rocky terrain, that challenged you to pick your line carefully, else get quite a jar not he perturbing rocks. This terrain persisted, broken up sometimes with some deep sand to keep you on your toes. All in all it was a great ride that would offer a fun challenge to all levels of rider (who are comfortable/experienced on the bike they have chosen). Easy enough for intermediate/advanced riders to get through, but more interesting the faster you go. 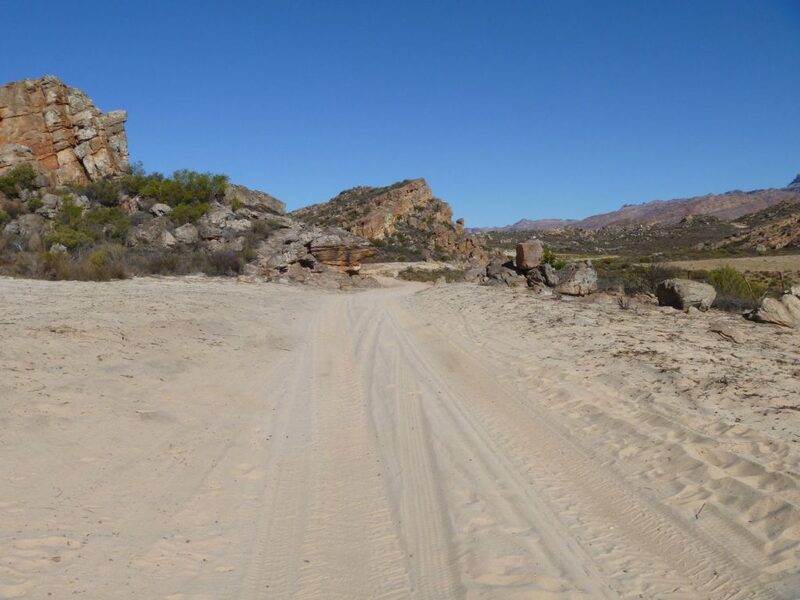 Coming out back onto the main dirt road, just before the Cederberg Oasis, I was ready for a beer by the time I arrived. I was travelling at the start of May (Autumn) but the days were still in the high 20s, and the exercise from the Eselbank Pass had worked up a thirst. 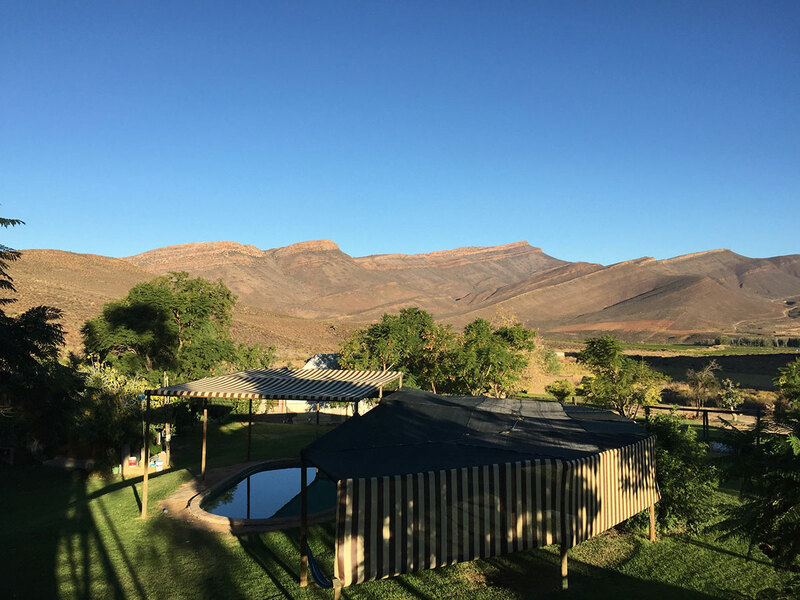 At Cederberg Oasis I was welcomed by the owner, Gerrit, who showed me to my room and explaining the honesty system for the bar. A quick shower and I was back down to grab a beer and head out to one of the hammocks they have on their large lawn, to watch the birds come into the oasis of the evening and the sun start to set. While I was there I was on a B&B basis, but they also offer pre-erected tents of various sizes and campsites. Dinner and breakfast were both cooked by Gerrit (and just what was needed to refuel after big ride). 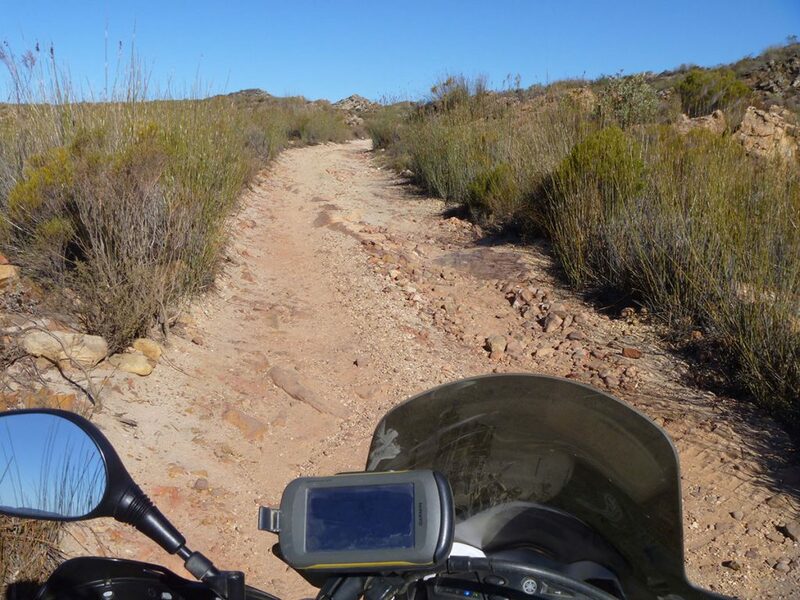 Even without the Cederberg ranges, the riding on the final day was a lot more varied than the first couple of days. In honesty, if I were to do it again (with more time) I would probably try to spend more time in the Cederberg and less in the Karoo. 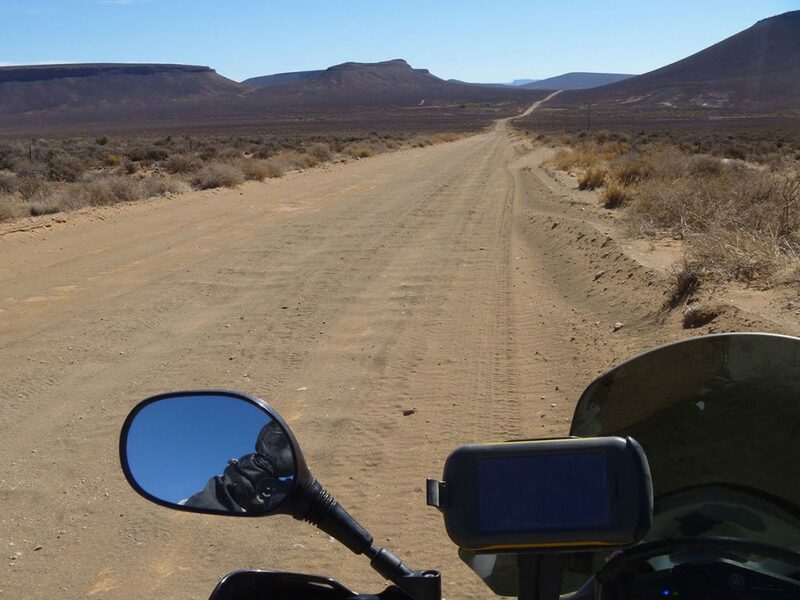 Basing yourself somewhere like the Cederberg Oasis, you could do much of fun riding I had done, along with a day into the Karoo Tankwa National Park and even the Old Postal Route. After checking out and topping up with fuel (Gerrit sells it out of jerry cans as there is no petrol station for a long way), I headed off to the south, enjoying the last of the Cederberg ranges, before heading out and down into the farmlands around Ceres and later into the wine country around Stellenbosch. 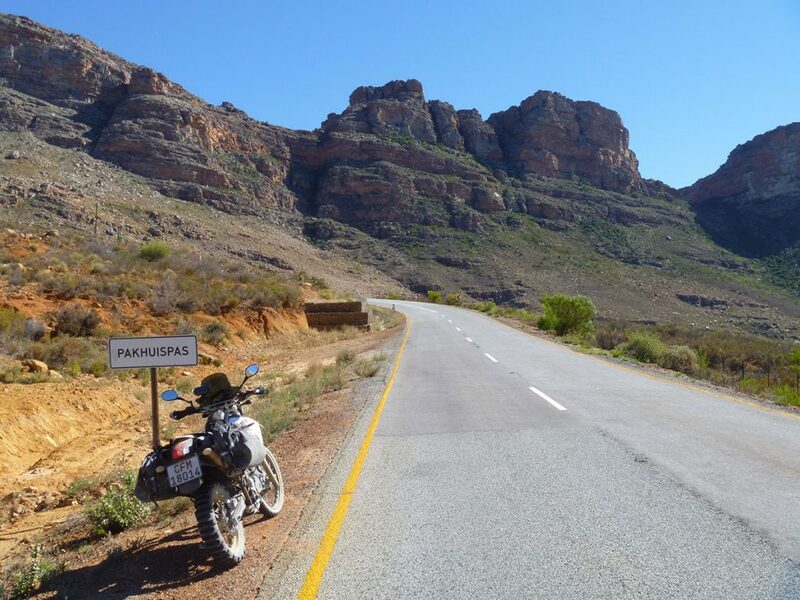 Just before you get into Ceres, there is a great section of the R303, that winds up and over the Gydopass. It’s quite tight and bumpy (not a problem on the XT) with the odd baboon crossing in front, to keep you on your toes. 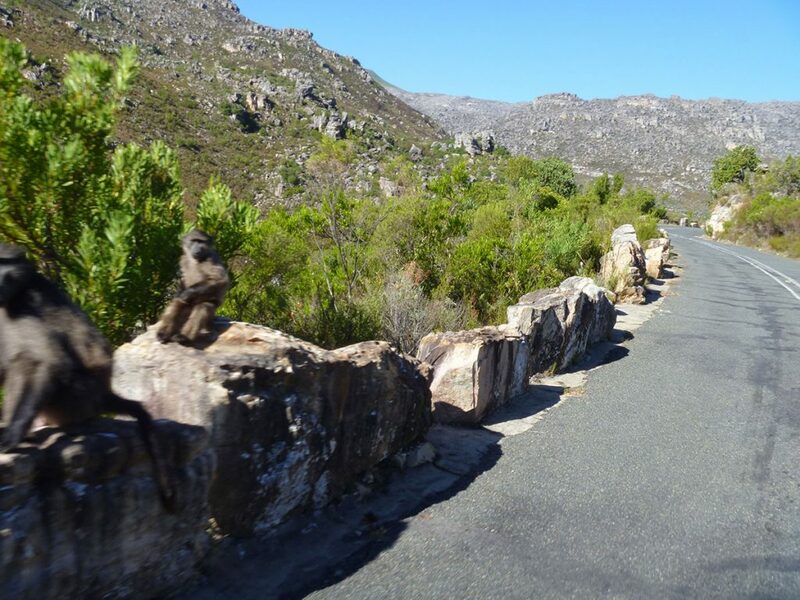 The final pass, Du Toits Kloof Pass, was also a pleasure to ride and a nice easy one to finish up on.The road was very well maintained and the sweeping views panned out over the wine country towards Paarl and Stellenbosch. I’d already had my fill of the wineries, but it would have been easy to pop into a few, either around Stellenboasch or Franshhoek on the last day. The hardest bit would have been spitting out the wine! Before finishing up went off-piste again and headed in towards the townships of Cape Flats to visit Duncan from African Overlanders. I’d heard about Duncan and his outfit from Adventure Rider Radio and just wanted to say hi. The location of the place is just outside of one of the many townships of the Cape Flats. My GPS actually took me through one with no exit, which kept me on edge a bit, but I just kept moving and found my way out again. Once I found the place Duncan met me at the gate as I arrived unannounced and invited me in for a chat. Duncan, a Brit from the south of England (Isle of Wight), has been in South Africa for seven years. After riding all over the continent he has set up a business (or three) importing/exporting peoples vehicles, working on their bikes and cars, accommodating them and even taking them on small bike motorcycle tours (a new business they are just setting up). He took me through the process of getting vehicle into Africa and the current state of the routes. I will go into this in more detail in another post, but the underlying advice was that the Western route was hands down the most interesting and best way to go. Finishing up with Duncan it was a stint in some famous Cape Town traffic, before getting back to Somerset West to drop off the bike. Neil was again most accommodating and hung around chatting while I repacked and waited for my Uber. Riding in South Africa was heaps of fun, especially having been stuck in London and riding dirt for ages. The trip that I did was very short and suited me as I was tacking it on to a work trip and couldn’t stay for longer, but I would definitely recommend staying a bit longer if you have the opportunity. 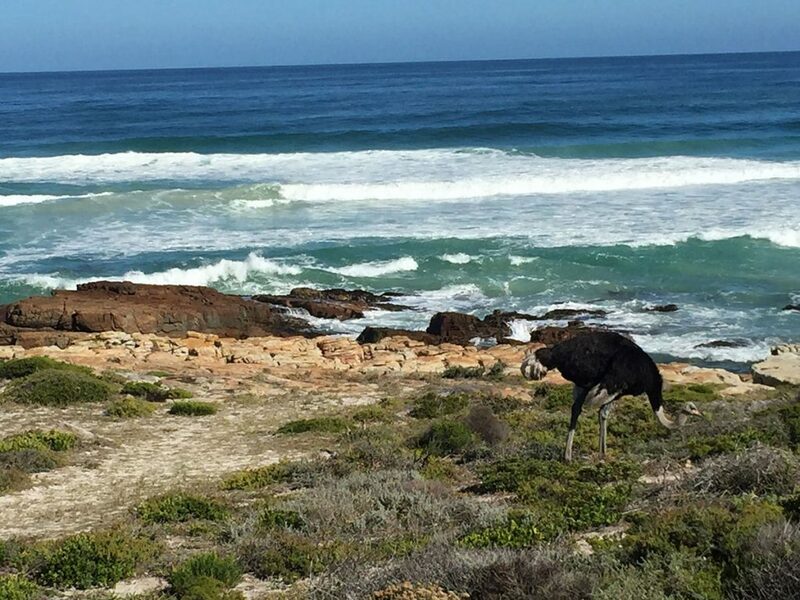 With regards to safety, except when riding (by accident) through the townships on the edge of Cape Town I felt completely safe and comfortable. I would thoroughly recommend the teams at Dualsport Africa and Yamaha Adventures. They run a seamless operation. The only thing I would recommend is that as the routes are published on their site, you do a bit of research to see if there are any extra bits you would like to add on/change and chat to the guys about it before you go, to personalise the experience a bit more.